Like any Italian built machine the Ferretti 881 follows design by form not function, beauty comes first and stepping on board for the first time will fill you with a passion and feeling that you are onboard a yacht that has beauty and soul, thus every time you see the Ferretti 881 you will fall in love with it. Once on board you will soon come to realise that style comes first. Every where you look you will be surprised by the attention to detail however Ferretti have all the classic elements of yacht design within the 881: The helms position is well forward to create a large living area saloon, there is the wide beam to create generous width. Throughout, there is the highly lacquered cherry interior, but individual options can be catered for by Ferretti to insure your own 881 personalisation however there is no denying the classic use of the cherry interior which matches beautifully with the tan leather and cream-colored, coarse-woven fabric on the walls and thin horizontal wood strips break up the panelling. This impressive dedication to design has allowed for the inclusion of two large open view windows in the master cabin. 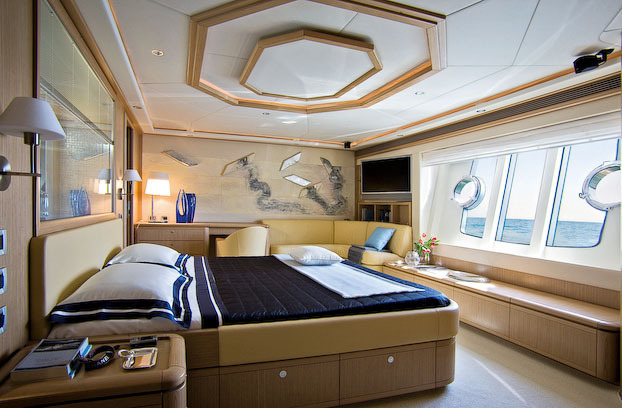 The bedroom part of the suite is on the port side, a seat by the window which seems to be almost under water is a spectacular place to be when cruising at speed. 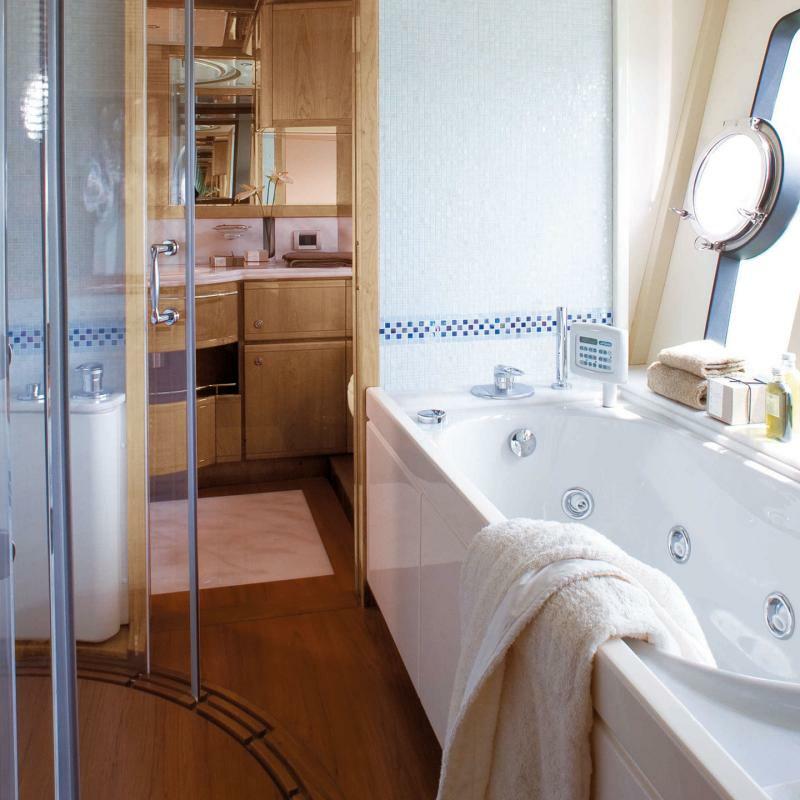 On the starboard side there is another of these windows allowing natural light to cover the full-size bath; an interior window allows a view right through from the bedroom, via the glass doors of the semi-circular shower cabinet. 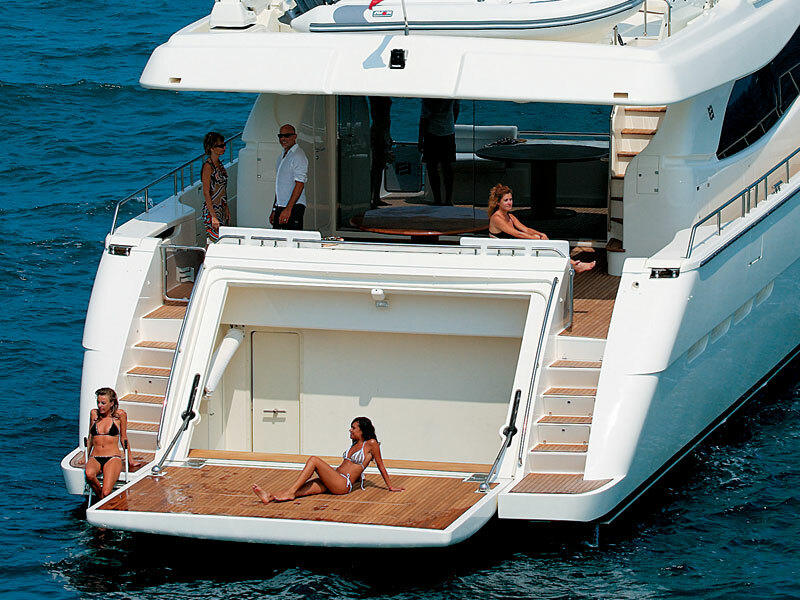 The arrangement takes your breath away, and is testament to Ferretti’s soul creating design within the 881. This master suite is a work of art, the style and elegance that surrounds it is a site to behold, time spent here can fly by as you can relax watching the world go by through the large side window. 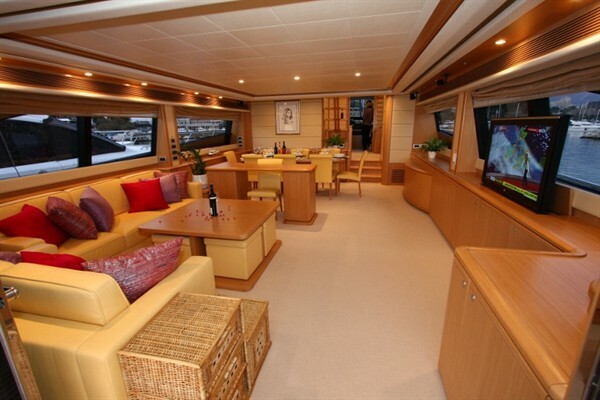 It’s certainly the place to be as the owner or a paying guest aboard the 881. The fly bridge area accommodates a barbecue and bar; large sun beds and an optional hot tub make this the place to be for entertaining in the sun. 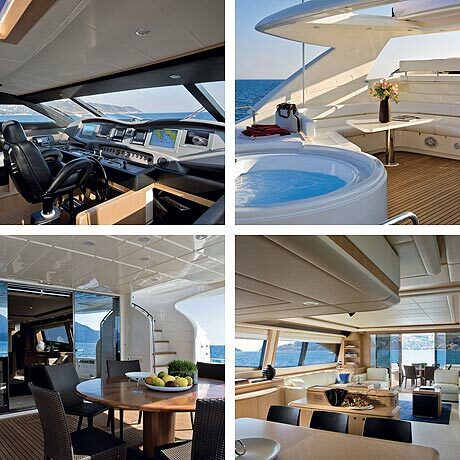 There is also a great view of the foredeck of the 881 from here and the additional sun pads on the foredeck a great place to be when cruising along. 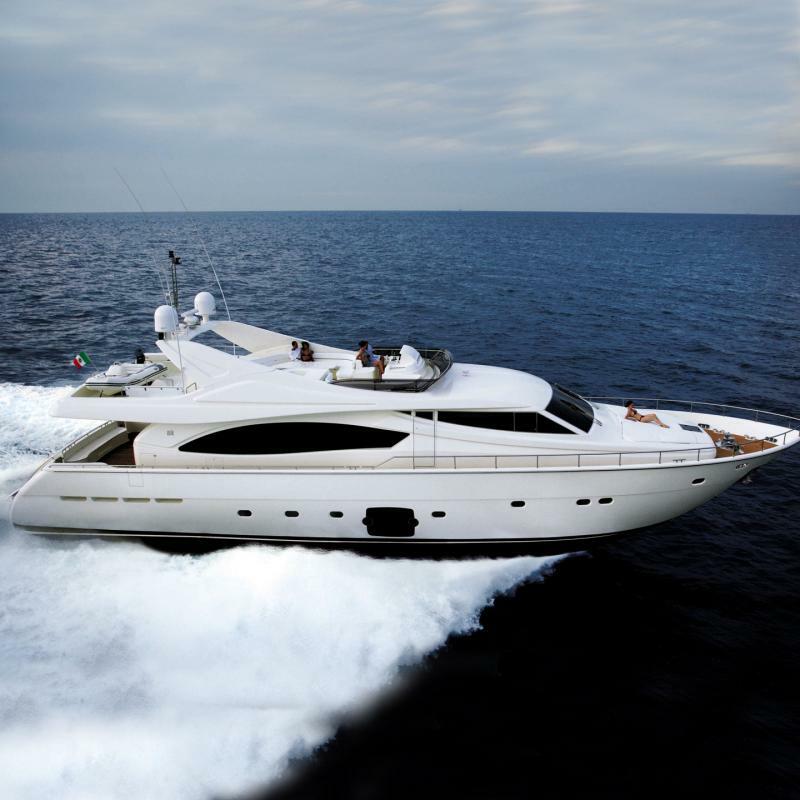 Ferretti can offer 2 x MTU 2200hp diesel engines giving the 881 an impressive 32 knot top speed and cruising speed of 28 knots. 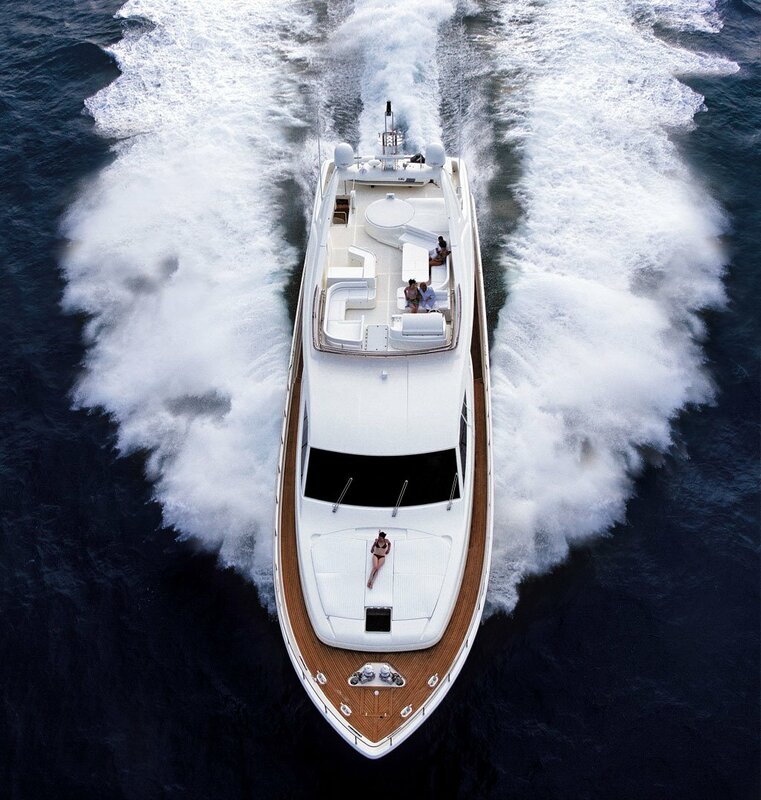 There is plenty of space in the engine compartment and it is here that you will find Ferretti’s anti rolling gyro system (ARG) fitted as standard giving the 881 reassuring stability when you’re anchored potting at low speed or cruising at full throttle. The garage built into the stern can accommodate a small tender or a Jet Ski. 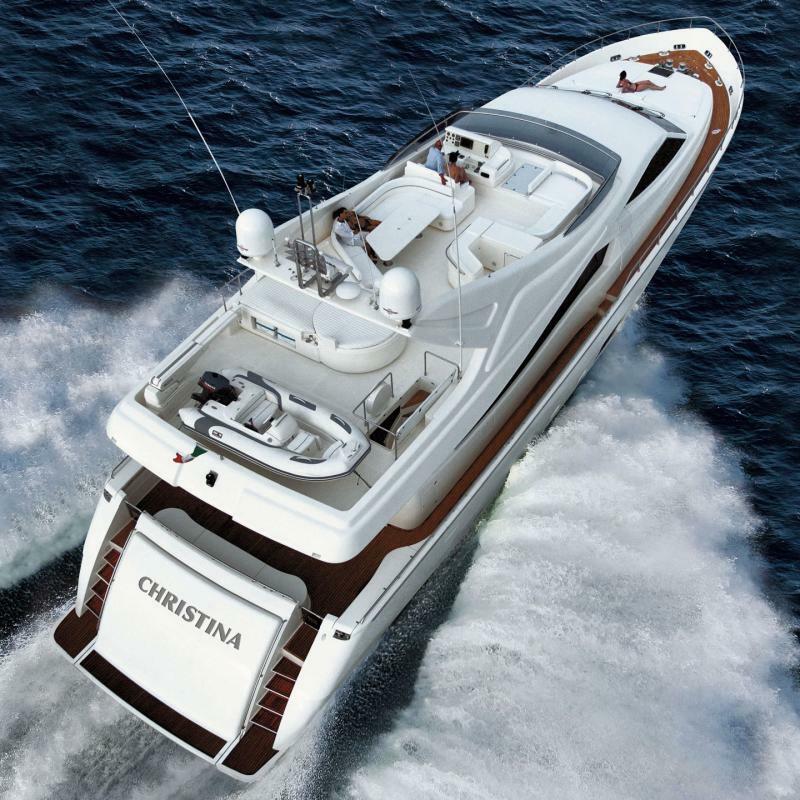 This is the usual thing, until you find that the large door hinges down to form what is virtually a teak-decked, water sports area and then the area becomes exceptional and again a surprising piece of design from Ferretti. 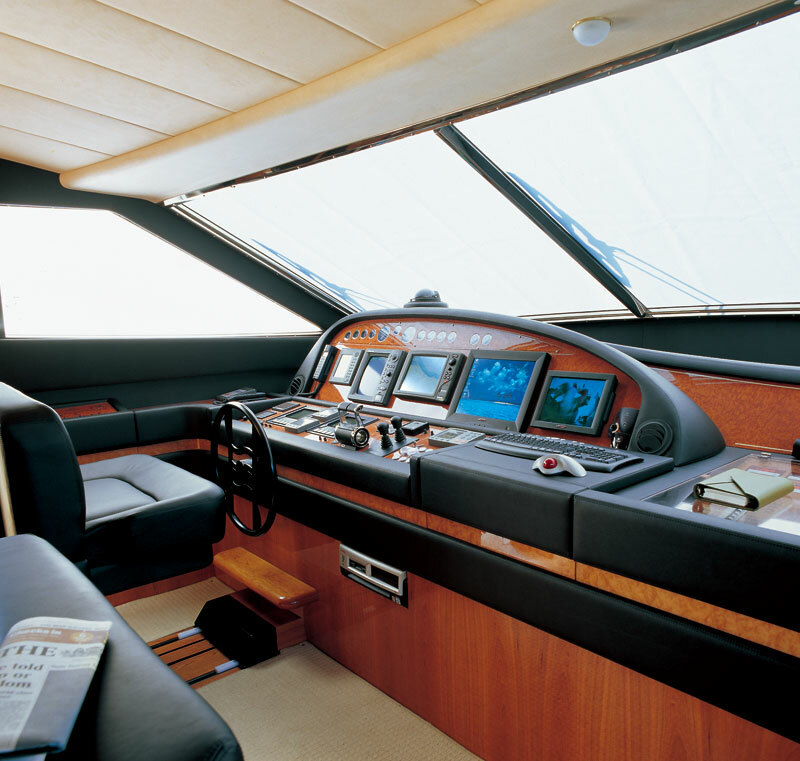 As a guest and owner of a Ferretti 881 the layout and design is logical in its form and engulfs you in a real sense of belonging but as a captain or helms you may feel the lower pilot position should be slightly wider if trying to accommodate 2 persons and the fly bridge helm could have a slightly large windscreen deflector however these are very minor points in what is a magnificent machine. Ferretti have made a master piece in the 881 a sports yacht that has you at handshake and makes you fall in love every time you see her. great review wsb, ferretti have been making some boats and the 881 is awesome had the chance to spend a weekend on one a month ago im looking forward to the larger new flagship from ferretti this year.